On St. Louis Street in the heart of New Orleans’s historic district lies the Omni Royal Orleans Hotel. Women in sunglasses clutching expensive purses step in and out of the hotel’s frosty lobby, and a man in a suit saunters through the glass front door. As they leave, they pass a small plaque on the outside of the Omni that labels it “One of America’s Historic Hotels.” What many of its wealthy guests do not know, is that the Omni claims the title ‘historic’ because it was once the St. Louis Hotel, the site of the most decadent and notorious slave auction in New Orleans. In the early nineteenth century, New Orleans hosted the largest slave markets in the country. In his book Soul by Soul, Harvard Historian Walter Johnson describes how the slave market was a southern institution. In his words, “the planter class imagined who they could be by who they could buy.” By 1854, the City Treasurer’s Census of Merchants listed 19 slave trading yards in the city. In some of these trading yards 50 to 100 people were forced to live in a space the size of a home lot. As the city grew off the backs of the slaves, the trade expanded. At the St. Louis Hotel, when people were placed on the auction block, they were dressed up in mock finery, and buyers could conduct business under a domed rotunda with a cocktail in hand. This was known as the City Exchange. St. Louis and Chartres Streets were home to multiple slave auctions, including the Maspero Slave Exchange, later renamed Hewlett’s Exchange when the building changed owners. A saloon and coffee shop in one, this building now hosts a restaurant named after the exchange itself; Pierre Maspero’s Restaurant. 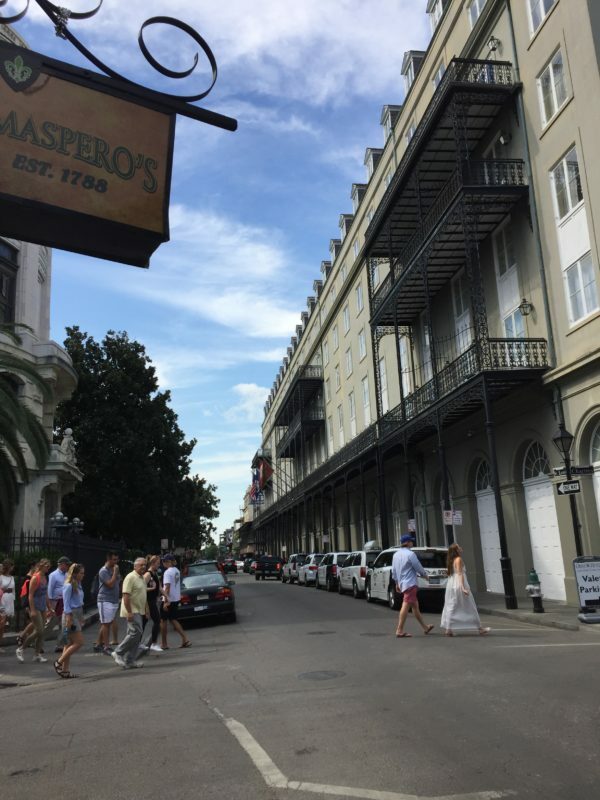 Despite the horrors that took place at the Omni Hotel, Pierre Maspero’s, and thousands of other locations and sites throughout the city; there are few plaques, monuments, or other markers in the city to memorialize this dark period in Louisiana’s past. While the city is lacking monuments and plaques commemorating the slave trade and its horrors, it certainly has no shortage of monuments and plaques commemorating Confederate leaders, Reconstruction-era Conservatives, and other white male supremacists. “This has always been about psychological war,” explained activist, poet, and founder of the grassroots movement, Take Em’ Down NOLA, Michael ‘Quess’ Moore. Take Em’ Down NOLA is a grassroots movement that is influential in lobbying the government to take down the monuments. “Every time there was a victory or gain on behalf of the African American community in New Orleans, there always was a rebuttal in terms of the Confederate flag, or monuments being put up,” Moore explains. These injustices did not go unnoticed. In 2017, a movement to take down these oppressive monuments swept through the South (although, the protests and requests to remove the monuments have been occurring for decades), and New Orleans was no exception. When the controversy over the monuments blew up, it was the buzz on the streets. Everyone was talking about the monuments. It was all over the news and social media. People flocked to libraries and research centers to read up on the history behind these monuments. Research institutions had to learn how to handle these inquisitors while maintaining their apolitical structures. One institution that has been handling questions concerning the monuments is the Williams Research Center, a two-story brick structure lying back on Chartres Street. The Williams Research Center is part of the greater Historic New Orleans Collection, which is home to some of New Orleans’s most extensive research and historical documents. As the Williams Research Center has fielded questions and inquiries from visitors about the confederate monuments and their history, the historians who work there have handled the controversial topic with discretion. “At this point, we as an institution haven’t addressed the monument removal at all; it’s hard when an issue is this politically relevant today,” explains Rebecca Smith, the head of reader services at the Center. The Williams Research Center struggles with strategies to remain impartial, and also how to guide its readers to historically accurate sources. The blow-up seemed to come out of nowhere. However, the controversy was just a culmination of a very long battle. Despite the long and often vicious struggle in New Orleans for removal, when it did happen it seemed to occur almost overnight. The four statues in question were spread out around New Orleans before they were taken down. The most visible was that of Robert E. Lee, which sat on the circle where the streetcar line loops from the Business Quarter towards the downtown French District. However, the Battle of Liberty Place Monument, an unsightly obelisk that sat hidden by the Mississippi River, was probably the most notorious symbol of white Supremacy. It was erected to honor the Democratic White League, a racist organization that attempted to seize control of the Louisiana government in 1974. It is clear that New Orleans, while it is making progress, still has a long way to go. Now the question becomes; what’s next? Tulane professor, archivist, and specialist in early American history, Emily Clark, attempts to answer this question. “We as historians look at all sorts of evidence,” she explains, leaning back slightly in her worn chair. “My preference is to look at evidence that is not trying to tell a story, that is–non-narrative evidence.” This is where the archives come in. Professor Clark sifts through pages of documentation to slowly reconstruct the lives of people who lived in New Orleans in the Antebellum era. Clark knows how much slavery is a part of the city’s identity. What frustrates her is that most of the citizens of New Orleans know this too. It’s the tourists that are left unaware. “The people who live here, in this majority African American city, they not only know the joyful cultural past, but they know that the city was built on people captured and forced to work here,” she explains. By refusing to acknowledge the lives and of the ancestors of thousands of its own citizens and the founders of its culture, New Orleans is living in denial. Berlin has an intriguing way of commemorating those who were murdered during the Holocaust under Nazi-era Germany. In front of particular houses, paving stones are slightly raised. They are called ‘stolperstein’ which translates literally to ‘stumbling block.’ When you look down on these raised paving stones, you see the names of those who lived in the adjacent house, and you learn that they were a family that was deported during the Holocaust. “You literally can’t walk the streets without confronting this history,” Professor Clark explains. While New Orleans probably won’t be able to add any stumbling blocks to its streets, there are many other ways New Orleans could work to commemorate its history and preserve its true identity. Professor Clark suggests plaques. Moore also believes that a lot more needs to change. What will be most telling in the future is not what New Orleans does with the monuments we see but what the city does with the monuments we don’t see. This article was originally written on December 19, 2017. It has been edited and updated for clarification. The author, Claire Davenport, is a senior at Tulane University, majoring in English and International Relations.